"3LA1, V-1952" by Timothy K. Perttula and Robert Z. Selden Jr.
DECORATION: The body of this vessel has four sets of trailed concentric half circles below a series of four trailed triangular elements whose apex intersects the central concentric half circle. The uppermost trailed triangular element is filled with tool punctates. Keno Trailed, var. 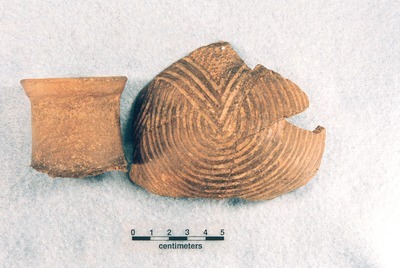 unspecified bottle (5425-2460/2464): a, neck and upper body; b, body sherds.